Based on a real photo, this creative laptop mockup template comes in 5000 x 3337 px resolution featuring smart objects and organized layers to let you easily edit the template. It also features a creative background environment as well. A modern laptop mockup featuring a creative working environment and a woman using the laptop. This is most suitable for crafting blog headers and using with portfolio websites. Another creative laptop mockup featuring a feminine design. 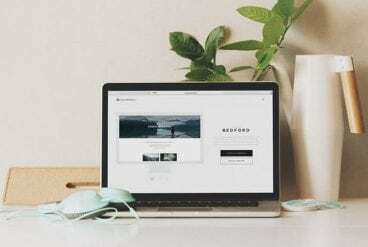 You can use this mockup to promote your products and designs in portfolios, social media, and blogs. The relaxed pose and the background of this mockup template make it most suitable for using with startup and creative agency websites. The template comes in 4092 x 4004 px resolution with smart objects. Are you a fan of MacBook mockups? We’ve got over 100 of them. Check out our massive MacBook mockups collection.